In accordance with the Taiwan government's project to double the sport-participating population, Falun Gong practitioners applied to participate in the Sport and Fitness Class with the Department of Education in Tainan in 2004 and 2005 and held related activities. Their active participation in the project in the past two years was recognized with the award for Outstanding Effective Planning to Double the Sport-Participating Population. 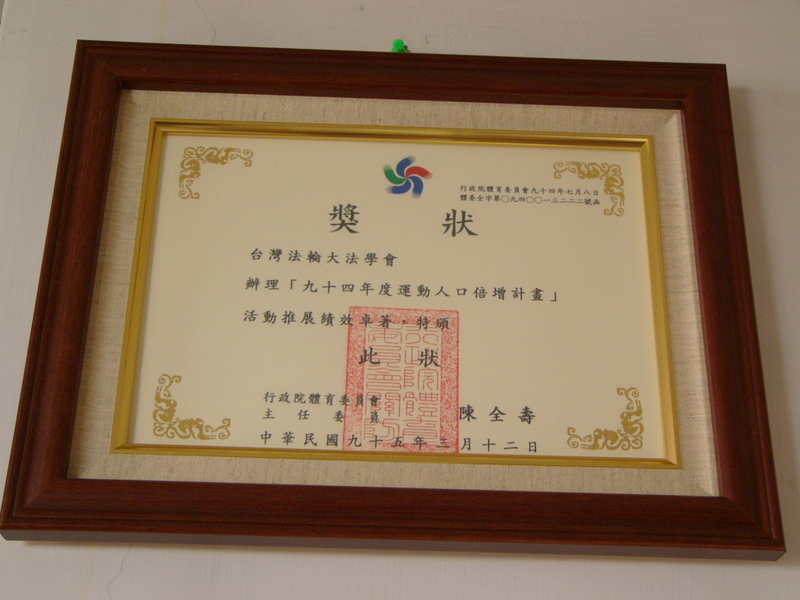 The award indicated that Falun Gong was well received in Tainan and its effect was well recognized. The Lantern Festival is a major folk festival celebration in Taiwan. It was held in Tainan from February 2 to March 6 in 2005. 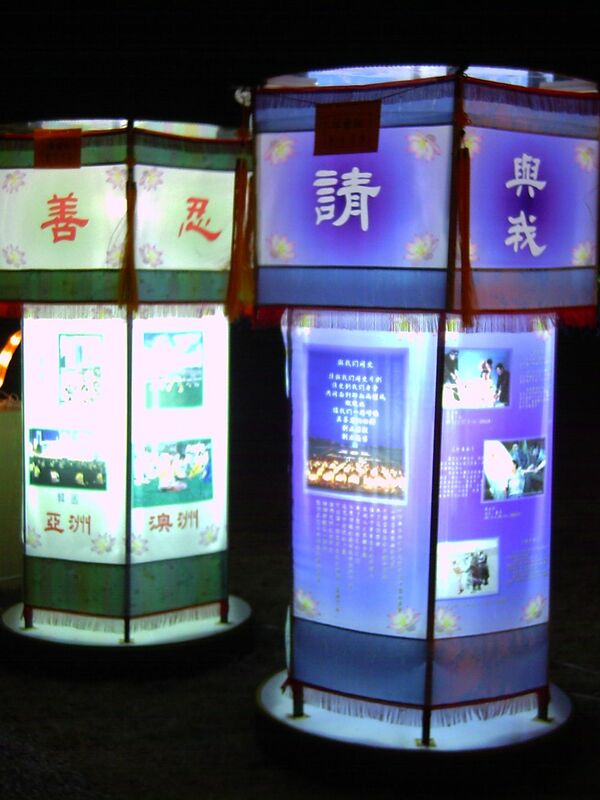 The Tainan government held a grand lantern contest. 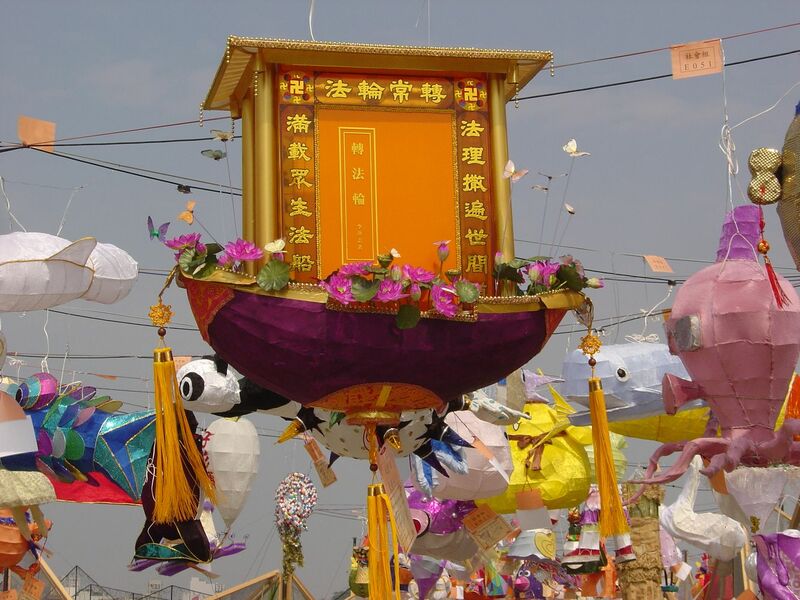 Tainan Falun Gong practitioners entered the contest with five sets of lanterns. The one themed "The Buddha Lights Illuminate Everywhere and Rectifies All Abnormalities" won the "Outstanding" award. 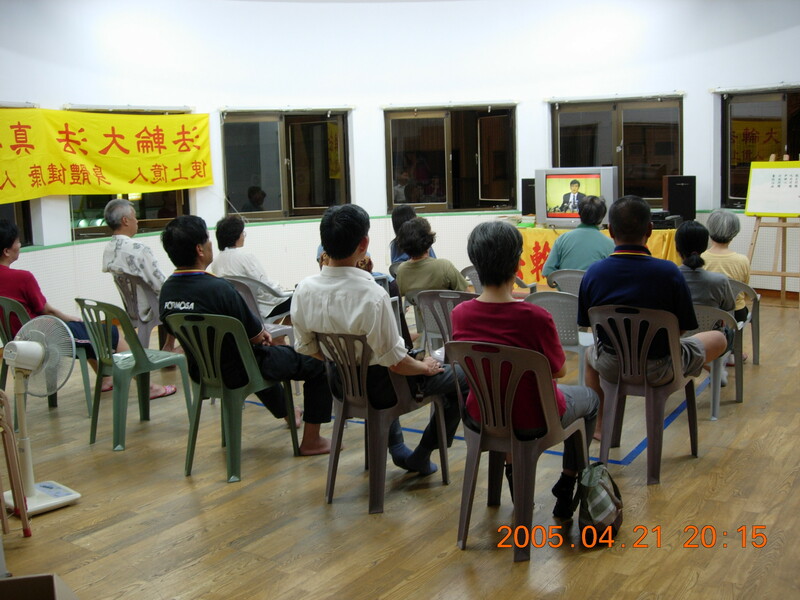 Nine-day Lecture Sessions Were Held in Wen Ping Li Community Activity Center, on Dong Ning Road and Da Tong Road. Students watch nine-day lecture video. New Falun Gong practitioners learn five sets of exercises. Five thousand Falun Gong practitioners from Taiwan, KinMen and Matsu Islands, undeterred by the rain and wind, celebrated World Falun Dafa Day in Taichung. Practitioners from Tainan participate in forming characters and the Falun emblem. Young practitioners from Tainan give a dance performance. Falun Gong practitioners held a one-day Fa-study and experience-sharing conference in the Tainan area on June 26, 2005. Falun Gong practitioners held a memorial service for their fellow practitioner in China, Ms. Gao Rongrong, after their experience-sharing conference. They also exposed the CCP's brutal persecution of Falun Gong. Many Falun Gong Teachers' Workshops have been held in Taiwan in the past six years. Teachers have high praise for the workshops. Their teaching, student management, and personal improvement have benefited a great deal from these workshops. 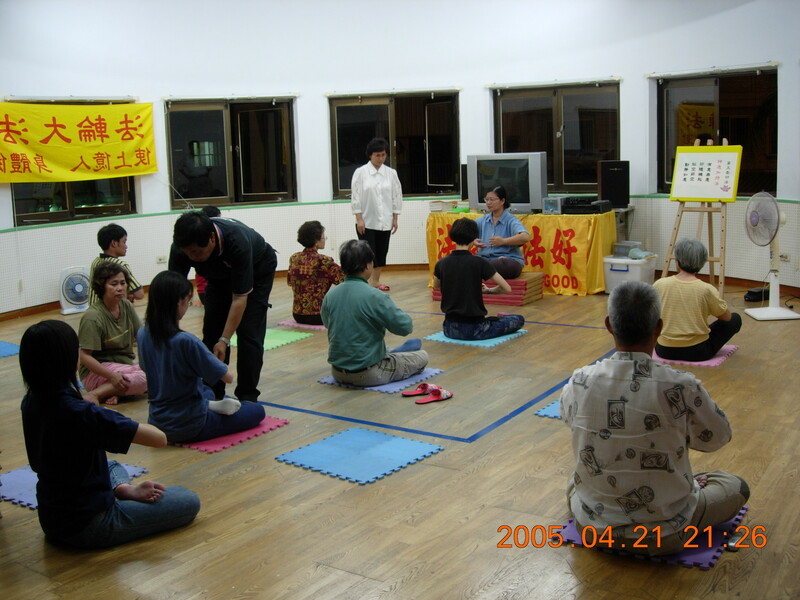 A Falun Gong Teachers' Workshop was sponsored by the Tainan government from July 4 to 8, 2005. The workshop played the nine-day lecture series by Mr. Li Hongzhi, founder of Falun Gong, and taught the five sets of Falun Gong exercises. New and old practitioners, including Professor Chen Yanling and Principal Xu Xiaolin, shared their experiences. Children of the Tainan Minghui School held a parade to let more people know about the workshop. They played drums, sang the song "Falun Dafa Is Good" and distributed flyers. It was a warm and peaceful atmosphere. Tainan Minghui School held a Falun Gong Children's Summer Camp at the Taitang Training Center from August 12 to 14, 2005. More than 100 children, from three-year-olds to high school freshman, participated in the camp. They were exposed to Truthfulness, Compassion, Tolerance through Fa-study, exercises, story telling, experience sharing, and other activities. The Falun Dafa Organization at National Cheng-Kung University ceremoniously held "Truthfulness, Compassion, Tolerance" International Art Exhibition in the Art Gallery of the University Library from Oct. 21 to Nov. 2, 2005. The "Truthfulness, Compassion, Tolerance" International Art Exhibition has been held simultaneously around the world. Outstanding artists who practice Falun Gong created artwork based on their understanding and experience of life. They showed the beauty of Falun Dafa and exposed the brutal persecution of Falun Gong by the CCP. The two-week-long exhibition attracted many students, professors, staff members, and tourists. The mayor and city council members visited the exhibition in person and planned to call for more attention to the situation of Falun Gong practitioners in Mainland China through TV. "The Journey of Fa-Rectification" Photo Exhibition was held at Xinxing Elementary from November 21 to 26, 2005. Practitioners collected signatures to help rescue persecuted Falun Gong children in Mainland China, conducted surveys, and gave out elegant bookmarks stating, "The World Needs Truthfulness, Compassion, Tolerance." Teachers and students enthusiastically visited the exhibition.